I wanted to repeat what I said last week in two different posts (see on the new Caucasus and Yamna Hungary samples, and on local groups in contact with Yamna settlers). We already knew that expanding East Bell Beakers had received influence from a population similar to the available Globular Amphorae culture samples. 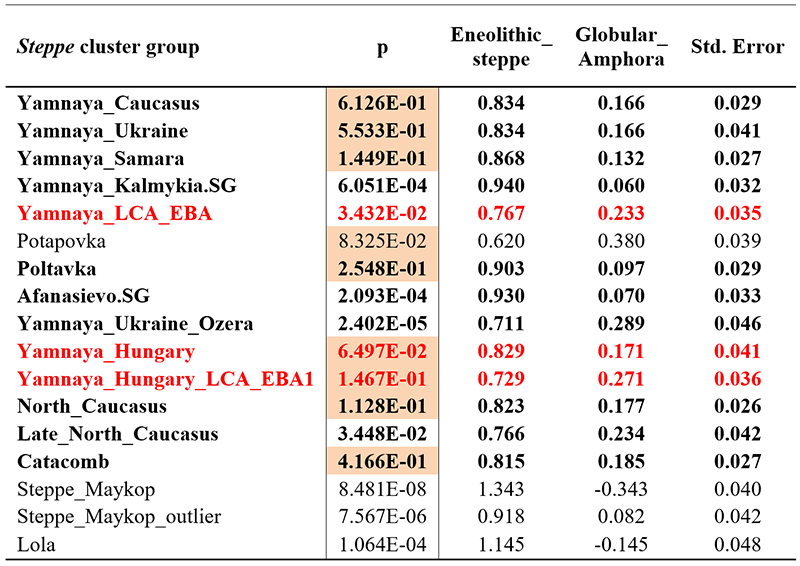 Without Yamna settlers, but with Yamna Ukraine and East Bell Beaker samples, including an admixed Yamna Bulgaria sample (from Olalde & Mathieson 2017, and then with their Nature 2018 papers), the most likely interpretation was that Yamna settlers had received GAC ancestry probably during their migration through the Balkans, before turning into East Bell Beakers. However, some comments still supported that it was Corded Ware migrants the ones behind the formation of East Bell Beakers. I couldn’t understand it. Now we have (with Wang et al. 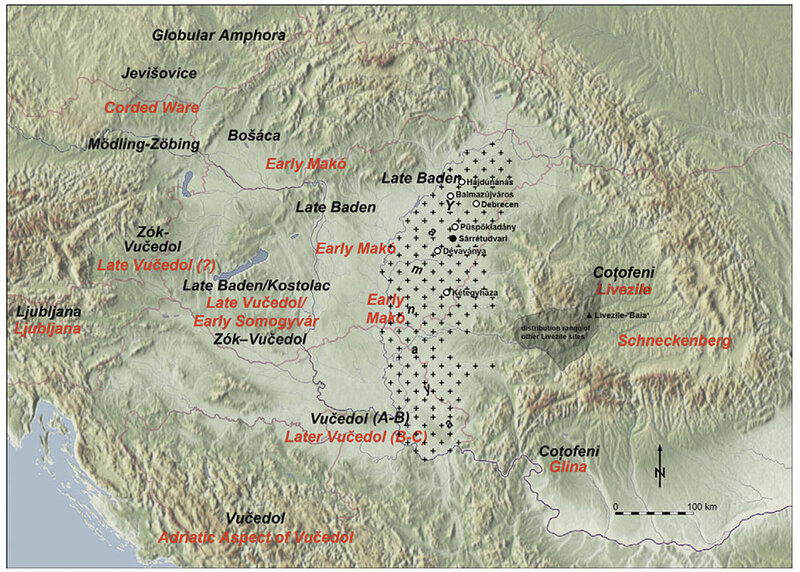 2018) Yamna settlers (identical to other Yamna groups and Afanasevo migrants) and GAC-like peoples coexisting with them in Hungary, with a Late Chalcolithic Yamna sample from Hungary showing a greater contribution from GAC. 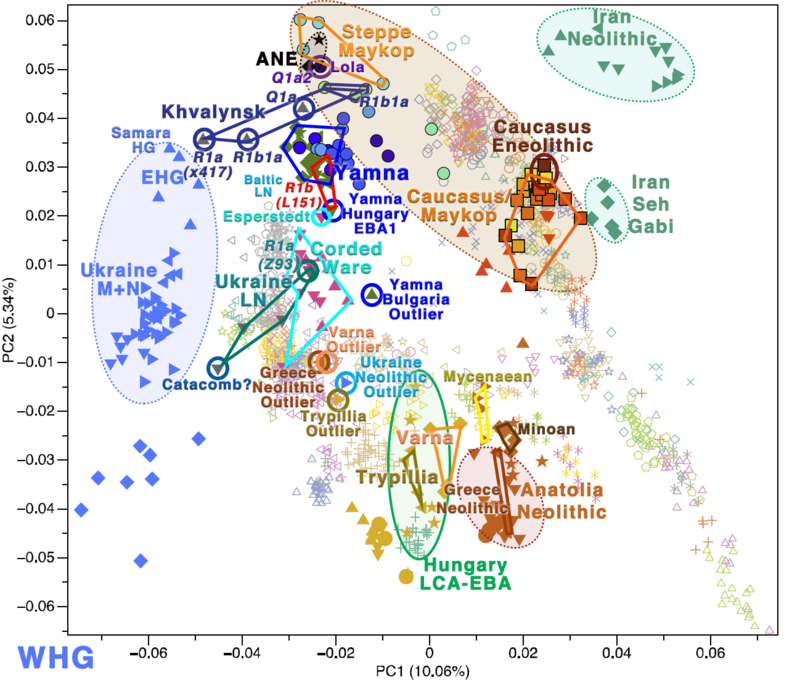 However, I still read discussions on Yamna settlers receiving GAC admixture from Corded Ware in Eastern Europe, from GAC in the Dnieper-Dniester area, in Budzhak/Usatovo, etc. I can’t understand this, either. I will post here the data we have, with the simplest maps and images showing the simplest possible model. No more long paragraphs. NOTE. 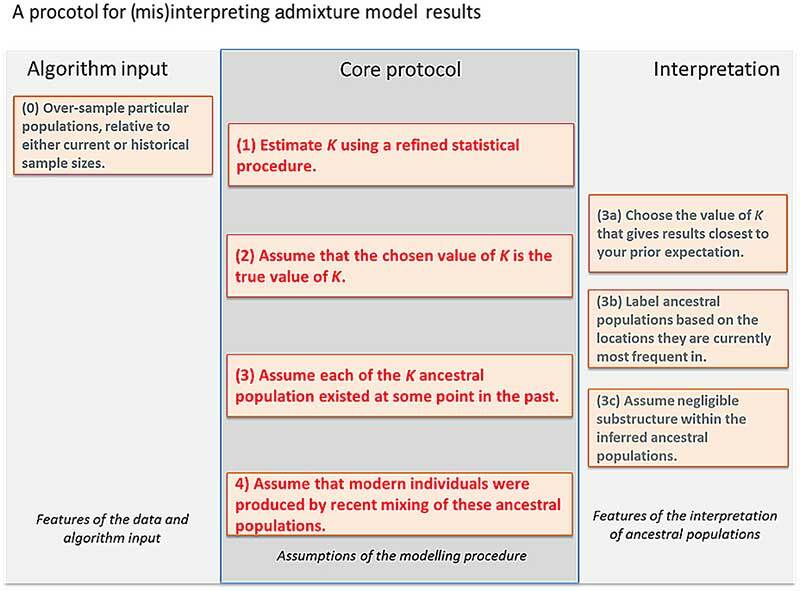 All this data does not mean that this model is certain, especially because we don’t have direct access to the samples. But it is the simplest and most likely one. Sometimes 2+2=4. Even if it turns out later to be false. 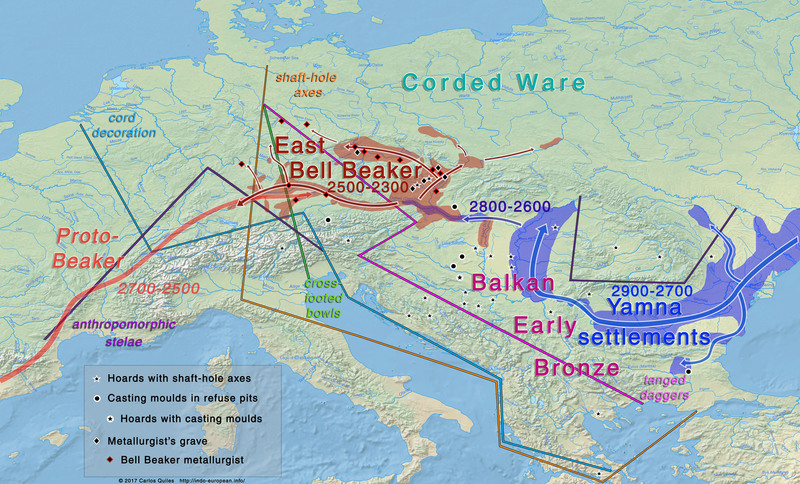 Yamna – Bell Beaker migration according to Heyd (2007, 2012). 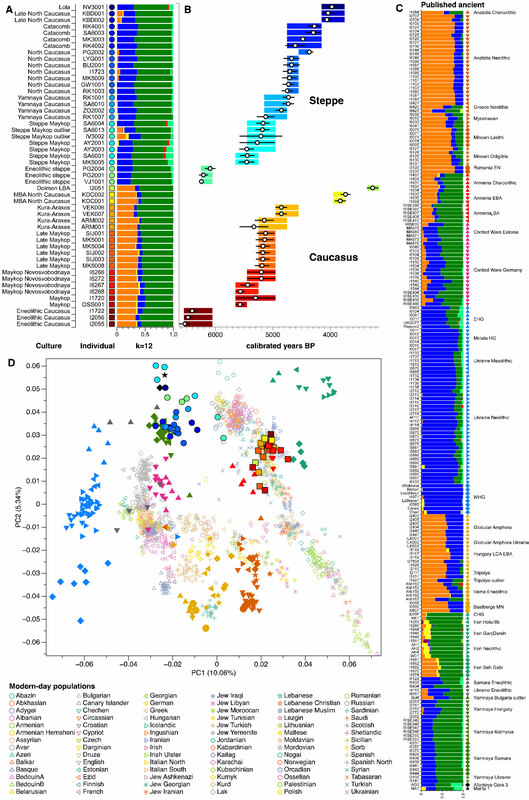 Most likely site of admixture with GAC is marked by the evolution of Blue to Red color. PCA results. 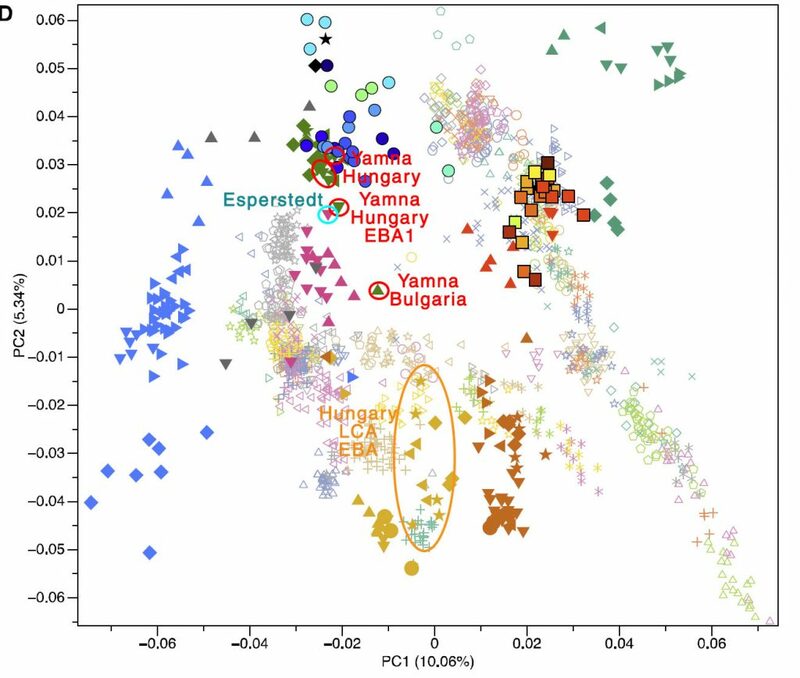 Samples from Yamna Hungary are surrounded by red circles, GAC-like Hungarian groups surrounded by light brown (see below for ADMIXTURE data) Notice the most likely Yamna Hungary sample with GAC admixture clustering closely to CWC Esperstedt outlier, and thus to some East Bell Beaker samples. 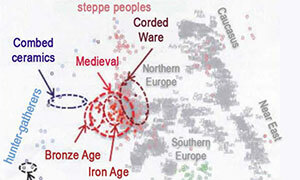 (d) shows these projected onto a PCA of 84 modern-day West Eurasian populations (open symbols). I already said that my initial interpretation of the Esperstedt outlier, dated ca. 2430 BC, as due to a late contribution directly from the steppe (i.e. 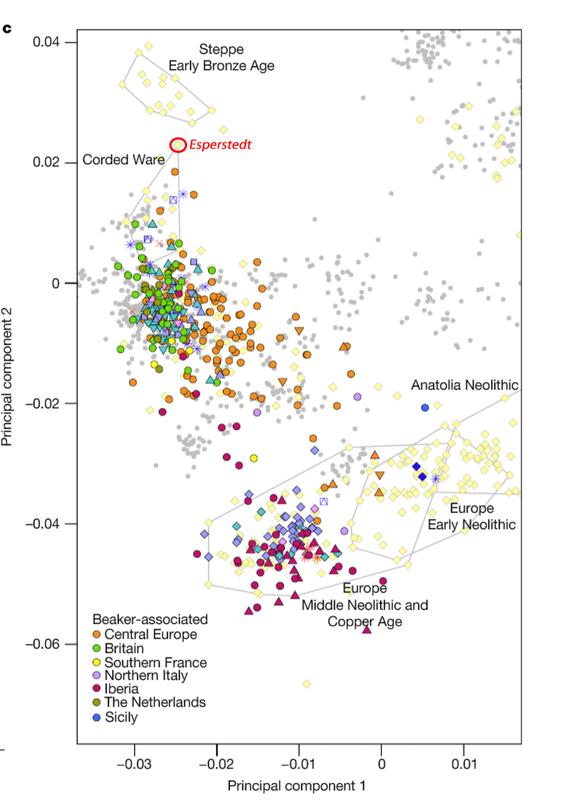 from long-range contacts between late Corded Ware groups from Europe and late groups from the steppe) was probably wrong, seeing how (in Olalde et al. 2017) early East Bell Beaker samples from Hungary and Central Europe clustered closely to this individual. 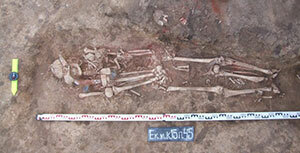 Now we see that fully ‘Yamnaya-like’ Yamna settlers lived in Hungary probably for two or three centuries ca. 2900-2600 BC, and the absorption of known (or unknown) Yamna vanguard groups found up to Saxony-Anhalt before 2600 BC would be enough to justify the genomic findings of this individual. An outlier it is, then. 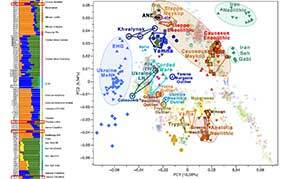 But probably from admixture with nearby Yamna-like people. Image modified by me, from Olalde et al. (2017). PCA of 999 Eurasian individuals. Marked is the Espersted Outlier. Archaeologist Volker Heyd is bringing his ERC Advanced Grant to Helsinki. So has proudly reported the University of Helskinki. 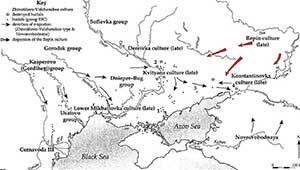 With his research group, Heyd wants to map out how the Yamnaya culture, also known as the Pit Grave culture, migrated from the Eurasian steppes to prehistoric south-eastern Europe approximately 3,000 years BCE. Most of the burial mounds typical of the Yamnaya culture have already been destroyed, but new techniques enable their identification and study. The project is using multidisciplinary methods to solve the mystery. Archaeologists are collaborating with scholars of biological and environmental sciences, using the methods of funerary archaeology, landscape archaeology and remote sensing that are at the group’s disposal. From the field of biological sciences, the group is making use of genetics/DNA analysis, biological anthropology and biogeochemistry. As for environmental sciences, their contribution is in the form of palaeoclimatology, which studies climate before modern meteorological observations, and soil formation processes. The project, coordinated by the discipline of archaeology at the University of Helsinki, will also welcome researchers from Mainz, London, Bristol and Budapest, in addition to which the group will collaborate with Czech, Slovak and Polish colleagues. Field studies and sample collection for the project will be conducted in Romania, Bulgaria, Hungary and Serbia. 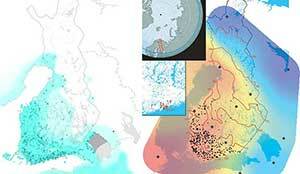 In Helsinki, Volker Heyd’s main collaborator is Professor Heikki Seppä from the Department of Geosciences and Geography on the Kumpula Campus, while the team will also be hiring three postdoctoral researchers. 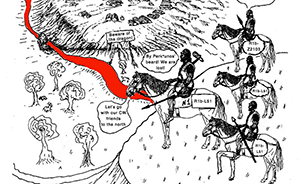 The researchers wish to understand how the Yamnaya migrated to Europe and how the arrival of a new culture changed an entire continent. How many people actually arrived? Taking the scale of the changes, some estimates range in the millions, but according to Volker Heyd, the number of people representing the Yamnaya culture in southeast Europe was around several ten thousands. It is indeed remarkable how such a relatively small group of people has had such a significant and far-reaching impact on Europe. The Yamnaya also brought with them new cultural and social norms that have had far-reaching consequences. For instance, patriarchy and monogamy seems to be part of the Yamnaya legacy. Another established theory speculates that marriages made women migrate and travel even across great distances. In accordance with primogeniture, the first-born son of the family inherited his parents’ possessions, while the younger siblings had to make their own way through other means. Among other things, this practice guaranteed ample human resources for the legions of the Roman Empire, which enabled its establishment and expansion, and later filled the ranks of medieval monasteries across Europe. Another interesting question is what made representatives of the Yamnaya culture migrate from the eastern European steppes to the west. 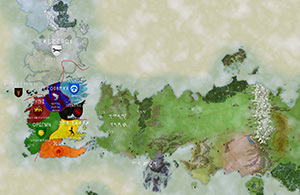 Heyd believes that the underlying reason may have been climate change. 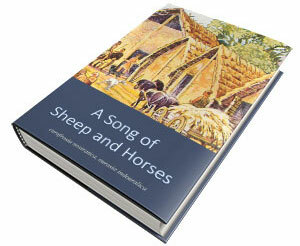 The Yamnaya were almost exclusively dependent on animal husbandry. As the climate changed – when rainfalls decreased in the east – they may have been forced to migrate west to secure the welfare of their cattle. Heyd has already been here as a visiting professor in the Helsinki University Humanities programme since the beginning of the year, working on another project. Together with Postdoctoral Researcher Kerkko Nordqvist, he is investigating the prehistoric settlement of north-eastern Europe 3,000 – 6,000 years ago with research methods similar to the new Yamnaya project. One of their central research questions is what made people migrate to this region, and which innovations they brought with them. In this case also, the reasons behind the migration may be related to changes in the environment and climate. This is probably bad news for research in the UK (I say probably because I guess many Brexiteers will be happy to have less foreign researchers in their country), but it is great news to see both researchers, Heyd and Nordqvist (whose Ph.D. thesis includes research on the Corded Ware culture that I have recently mentioned) – , be able to collaborate together to assess Indo-European and Uralic migrations. 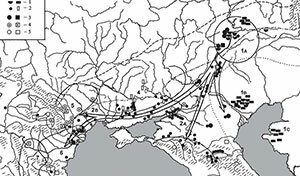 ‘The Yamnaya Impact‘: Archaeology and scientific research of/into the Yamnaya populations of Southeastern Europe and their impact on contemporary local and neighboring 3rd millennium BC societies as well as their role in the emergence of the Corded Ware and Bell Beaker complexes in Europe. ‘The Prehistoric Peopling of Northeastern Europe‘: Inter-/crossdisciplinary studies on the archaeology, anthropology, linguistics, and bio- and environmental sciences of early Uralic speakers and their first horizon of interactions with Indo-European speakers. This wider project is in cooperation with colleagues from Helsinki and Turku Universities in Finland, as well as from Russia, Estonia and Poland. ‘Czech Republic‘: I am closely cooperating with the Institute of Archaeology, Czech Academy of Sciences, in Prague for two research projects funded by the Czech Grant Agency in which we measure various isotopes from human remains in Bristol to understand past mobility and diet. The Humboldt-Kolleg -conference ‘Reinecke’s Heritage’ (with P. Pavúk, M. Ernée and J. Peska) held in June 2017 at Chateau Křtiny/Moravia is also part of this cooperation. See, for further information: http://ukar.ff.cuni.cz/reinecke. 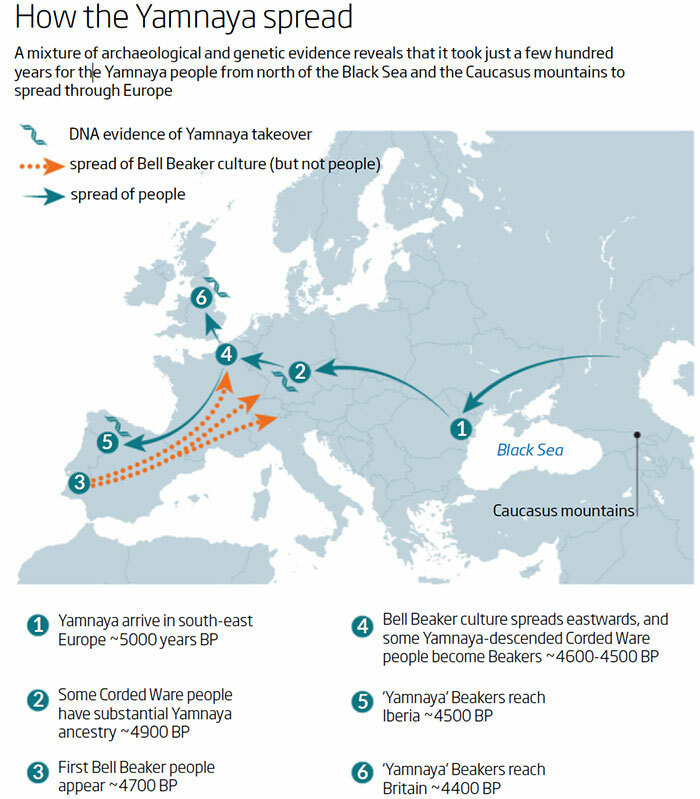 On the genetic aspect, we have gross Yamna migrations today as clearly depicted as they will ever be: late Khvalynsk/Yamna expanded Late Proto-Indo-European languages, and Bell Beakers brought North-West Indo-European to almost all of Europe, as predicted in Harrison and Heyd (2007). Full stop. 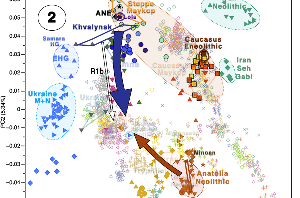 There is still fine-grained population structure, though, as Lazaridis puts it, to be detected in migratory movements contemporary or subsequent to the Yamna settlements in South-East Europe and the East Bell Beaker expansion. We will probably lack a comprehensive description of local archaeological cultural exchanges – to fit the potential dialectal developments and expansions – to be coupled with small-scale migratory movements in genetics, as more samples are made available. 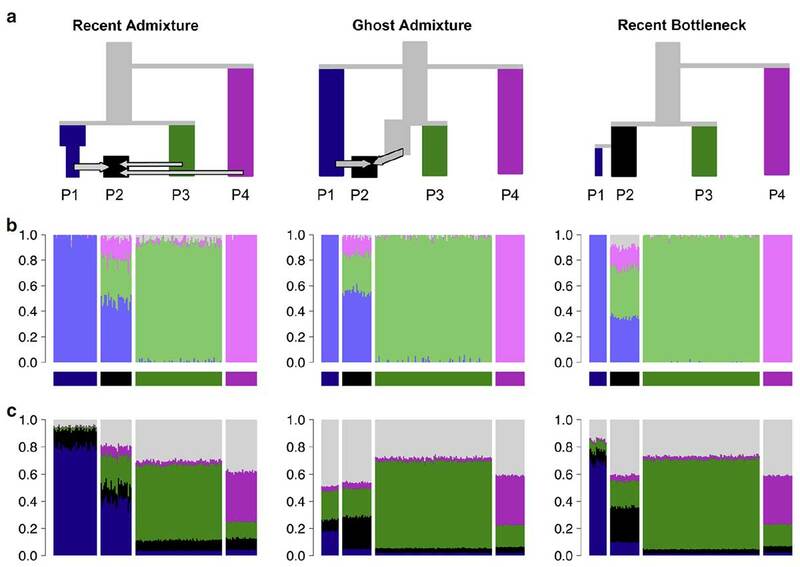 This work from the University of Helsinki will hopefully provide the necessary detailed anthropological foundations to be used with future genetic studies to obtain a more precise picture of the formation and expansion of North-West Indo-Europeans. 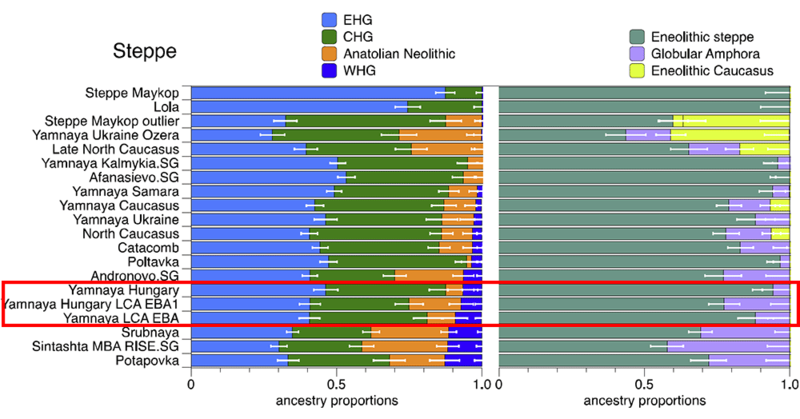 New (copyrighted) preprint at BioRxiv, Population Replacement in Early Neolithic Britain, by Brace et al. (2018). Also, Genetiker has updated Y-SNP calls from new data published from the Harvard group. 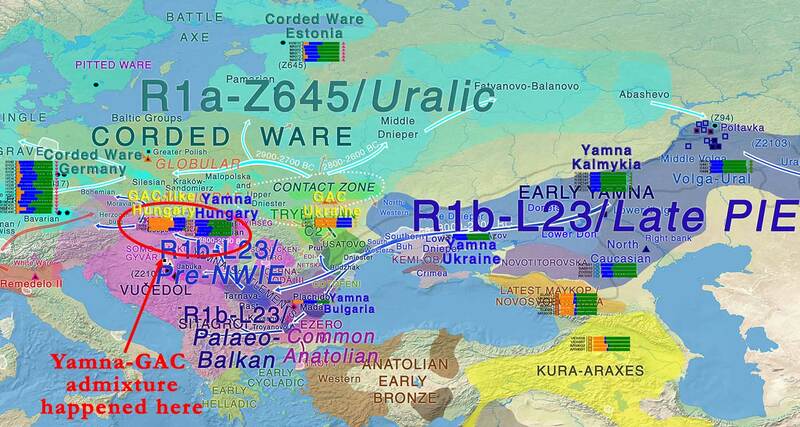 The R1b lineages that expanded from (Yamna->) East Bell Beakers -> Western Europe are more and more clearly of R1b-L151 subclades, as expected. 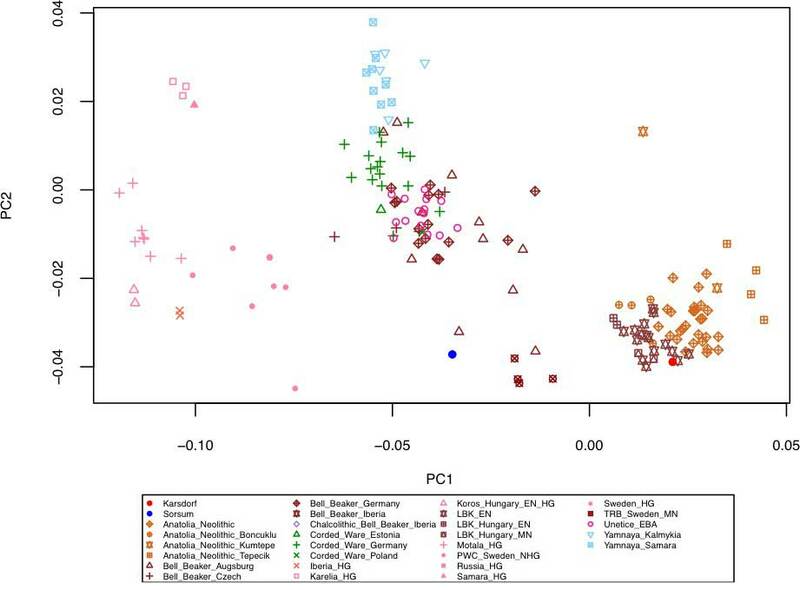 Quite interesting are the early samples from Poland, of R1b1a1a2a2-Z2103 and R1b1a1a2a1a-L151 lineages – , which may point (different to the more homogeneous L151 distribution in Western Europe) to a mix in both original (east-west) Yamna groups. This could tentatively be used to explain the Graeco-Aryan influence that some linguists see in Balto-Slavic (or its superstrate). 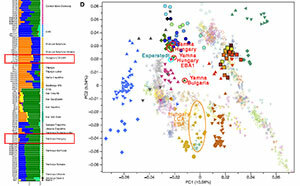 That link would then be quite early, to account for an influence during the Yamna settlements in Hungary, before its expansion as East Bell Beakers, but we haven’t seen a clearly differentiated subgroup (yet) in Archaeology, Anthropology, or Genomics within the Hungarian Yamna/East Bell Beaker community, so I am not convinced. 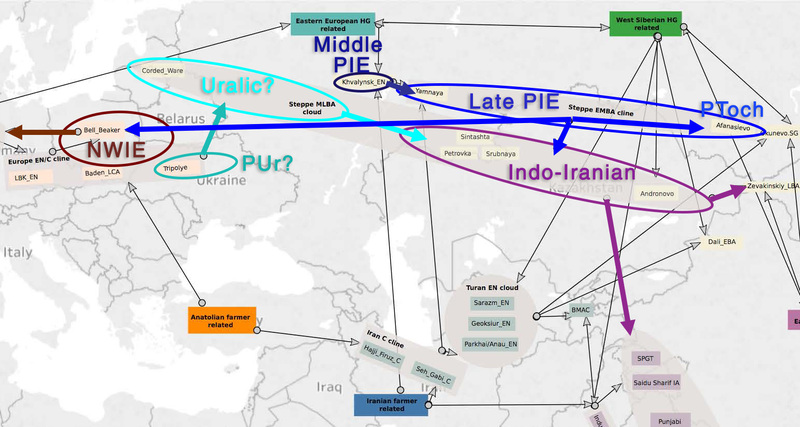 It could be just that different scattered subclades mixed with the general L151 population pop up (following old Yamna lineages, or having being added along the way), as expected in an expansion over such a great territory – as if some scattered samples of R1a, I1, I2, J, etc. were found. 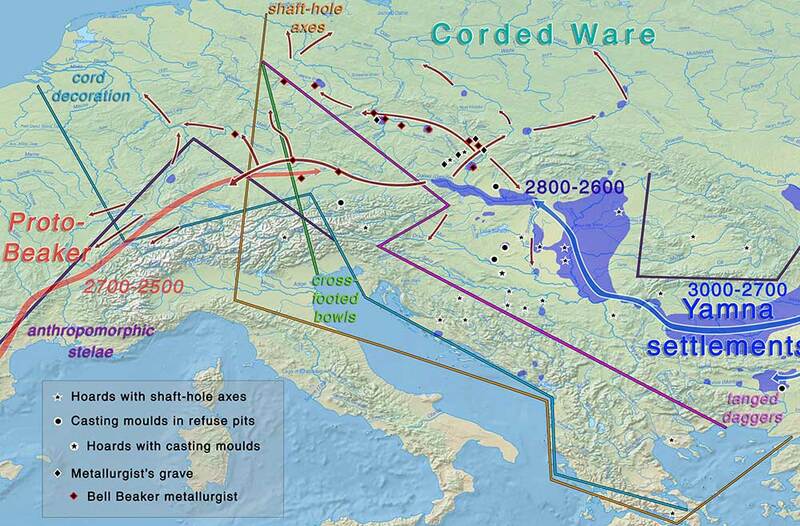 We need more early samples from south-eastern Europe and the steppe during the Chalcolithic to ascertain the composition and migration paths of the different Yamna settlers. 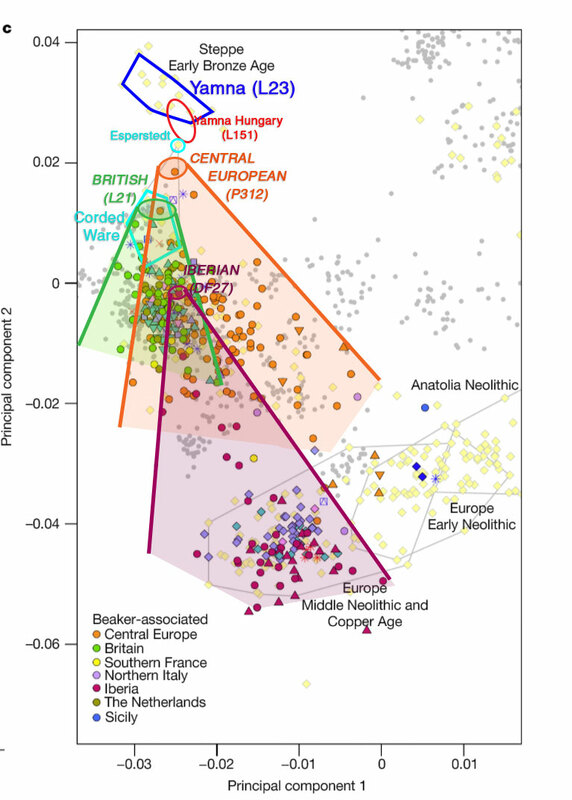 Other interesting findings are the early (Proto-)Bell Beaker samples of haplogroup R1b with no steppe ancestry from Spain – which some autochthonous continuists wanted to believe was a proof of some kind – , which are actually R1b-V88, a haplogroup known to have expanded throughout Europe quite early. 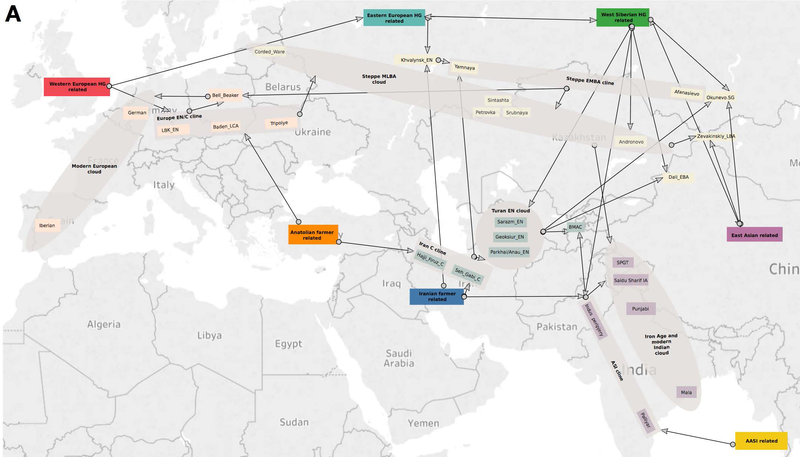 In fact, this subclade has been recently shown to have most likely expanded through the Green Sahara region, and is potentially linked to the expansion of Afro-Asiatic.